The Arria II GX Video Development System is an ideal video processing platform for high-end video applications. Terasic recognized for its strong design expertise in high-end video, imaging and multimedia products have made available a video development package that targets video processing development using an Arria II GX device. The package includes an Arria II GX FPGA development kit (DK-DEV-2AGX125N) featuring an EP2AGX FPGA device with HSMC connectors to allow additional functionality and connectivity via HSMC daughter boards. 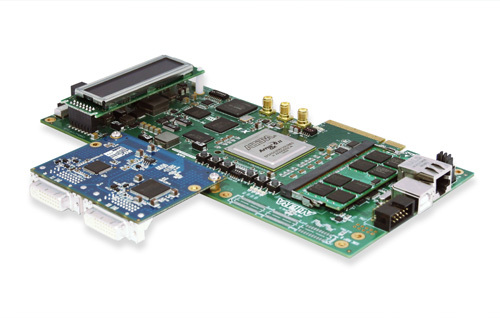 The Arria II GX FPGA development kit delivers a complete PCI Express-based development platform. This interface uses the Arria II GX device’s PCI Express hard IP to accelerate development time for high-volume PCI Express applications including add-in cards, host bus adapters, graphics cards, and high-end servers. Furthermore, the board includes an abundant amount of memory including on-board DDR3 device and DDR2 SODIMM, creating a complete integrated memory interface solution for memory-intensive applications. The DVI-HSMC daughter card part of the bundled package will allow developers to access high quality and high resolution video signals that can support resolution up to 1600x1200. A complete DVI video controller design with source code is provided.